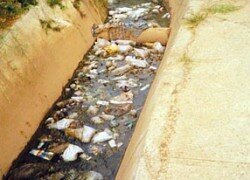 THERE is need for residents to dump litter and garbage in designated locations to avoid outbreak of communicable diseases and report those found wanting to relevant authorities for possible punitive action, says Patriotic Front (PF) Justin Kabwe ward councillor Teddy Mwaba. In an interview yesterday, Mr Mwaba bemoaned the continued blockage of sewer system owing to the throwing of litter, diapers and other insoluble materials by residents due to the stealing of sewer covers by suspected metal scrap dealers which had left various sewer systems open. He said that the Lusaka City Council had been doing its best to collect garbage and unblock the sewer system such as the ones at behind Heroes’ Lodge and near Marapodi police station and appealed to residents to dispose garbage and litter at designated locations for ease of collection. “I would like to strongly appeal to residents of Justin Kabwe to take it upon themselves to dispose of litter and garbage in designated areas of collection to avoid any likelihood of a breakout of communicable diseases. ‘‘There is need for residents to report anyone one found in the vice to relevant authorities for possible punitive action to deter others,” he said. Mr Mwaba said that in consultation with the local authority and other stakeholders such as the Millennium Challenge Account, he had considered to procure concrete covers for the sewer system unlike metal ones. He said that he would soon embark on a keep your area clean campaign with Mandevu Member of Parliament (MP) Jean Kapata aimed at sensitization of the need for a clean and healthy environment. Mr Mwaba has urged the youths of the area to come up with cooperatives that would help with the collection of garbage, stating that the venture was a lucrative business and that they were available opportunities to negotiate with stakeholders such as his office.